As we know, NSIDC only publish Arctic sea ice data from 1979. As I have pointed out many times, this just happens to coincide with one of the coldest periods of the 20thC in the Arctic. It would therefore seem reasonable to suppose that Arctic sea ice extent was expanded as a result. The IPCC SAR in 1995 gives us some clues, showing that Arctic sea ice extent for D/J/F increased by nearly 2 million sq km between 1973 and 1979. (The black line is a 128-point binomial). To put this number in perspective, NSIDC show extent in January 1979 at 15.6 million sq km, implying a figure of under 14.0 million sq km for 1973. This compares with a figure of 13.5 million sq km last month. But we also know from HH Lamb that George Kukla estimated that the area of snow and ice, integrated over the year across the Northern Hemisphere, was 12% more in 1973 than in 1967, when the first satellite surveys were made. This, of course, includes snow and land ice as well, but is nevertheless indicative of an expansion of sea ice prior to the beginning of the IPCC graph in 1973. This also tallies with the estimate of a 10 to 15% in ice during the early 1970s, included in the CIA report on climate in 1974. HH Lamb also tells us that a greatly increased flow of the cold East Greenland Current has in several years (especially 1968 and 1969, but also 1965, 1975 and 1979) brought more Arctic sea ice to the coasts of Iceland than for fifty years. In April-May 1968 and 1969, the island was half surrounded by ice, as had not occurred since 1888. All of the evidence points to ice extents well below the 1973 figure prior to the mid 1960s, thus implying an even lower figure than 14.0 million sq km, surmised above for 1973. NSIDC, on the other hand, have attempted to hide this increase. 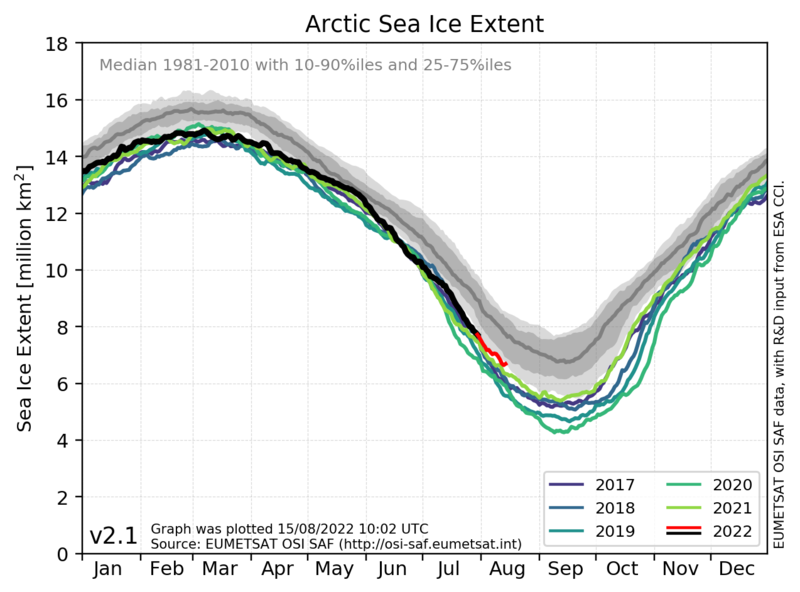 Note that their ice extent dips sharply between 1968 and 1974, just when Kukla, Lamb and the CIA were reporting the opposite. Satellite data from the SMMR and SSM/I instruments have been combined with earlier observations from ice charts and other sources to yield a time series of Arctic ice extent from the early 1900s onward. What might the pre-1953 period show that they seem so keen to hide? 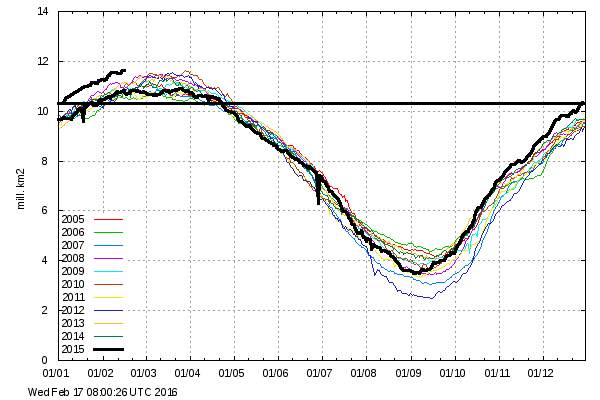 Does anybody seriously expect the ice not to return, when the AMO turns cold in due course? 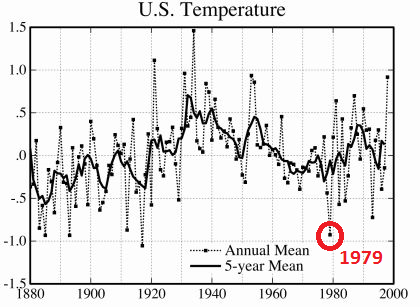 I should point out that the NSIDC graph for 1953 to 2012, shown above, does not relate to actual measurements prior to 1979. It is basically just a reconstruction, based on a number of sources. In other words, a guesstimate. Now would be a good time to show support for the MASIE ice product. Denmark’s Meteorologiske Institut (DMI) has had a graph comparing the current year to the preceding ten years’ “30%+” Arctic sea ice extent, with coastal zones masked out, by graphing each year in a different color on the same horizontal timescale. They also have a graph comparing the current year to the preceding four years’ “15%+” Arctic sea ice extent. In both graphs, the current (partial) year is graphed with a heavier black line. As of January 2016, depending on which graph you choose, you could “prove” that Arctic sea ice extent is either the highest (in the “30%+” graph) it’s been in the last eleven years, or the nearly the lowest (in the “15%+” graph) it’s been in the last five years. On 2016-02-18 DMI discontinued the “30%+” version, which showed high recent ice extents. Joe Bastardi on WeatherBell Analytics says that the Arctic ice won’t return until we have both a negative AMO and negative PDO. The evidence suggests that the PDO is squarely in the downward trend of a negative phase, and the AMO is still awaiting a turn downward. It may be another 5-10 years before both sync up. But again, regardless of the phases, if the projections for a decline in sunspot activity and solar output pan out, then we may see more of a return while the PDO is negative and before the AMO declines to match. Thoughts? There were sea ice extent observations prior to 1979 – the start of satellite records. The decline in sea ice appears to be coincident with the satellite record and very likely the result of decaying orbits. In more recent times, the sea ice extent appears to have become more stable as the satellite platforms have more stable orbits.